I was first introduced to Antonio Vivaldi’s quartet of violin concertos, The Four Seasons (published in 1725), when I saw the 1981 movie of the same title, starring Alan Alda, Carol Burnett, Rita Moreno, Jack Weston, Len Cariou, Bess Armstrong, and Sandy Dennis. Thanks to that film’s soundtrack, I’ve been a fan of this composition ever since. Thirty years later, after visiting the Chiesa di San Rocco, a gorgeous Roman Catholic church that houses the remains of the saint, I passed by the Scuola Grande di San Rocco in the same campo, just a stone’s throw from my B&B in Venice. My eyes immediately fixed upon the sandwich board advertising a live performance of The Four Seasons. I purchased a ticket on the spot. The night of the concert arrived a couple of days later, and I was excited to attend a performance of my favorite piece of classical music. What I wasn’t anticipating, however, was the mind-blowing beauty of the scuola itself. The Miracle of Manna, circa 1577, is one of Tintoretto’s masterful oil paintings covering the ceiling. Scuole grandi were “great schools” — Christian voluntary charitable and religious associations of lay people in Venice, many of which played a major role in the history and development of music. The Scuola Grande di San Rocco was completed in the mid- to late 1500s, dedicated to the man who was born at the end of the 1200s into a noble French family and abnegated all his wealth and privilege to care for plague victims in Italy. Rocco (or the French Roche) became sick but miraculously recovered with the help of a dog that took bread to him in the forest. When he returned home to France, physically altered from his suffering, his family did not recognize him, so he was arrested as a spy, dying in jail in 1327 at age 32. 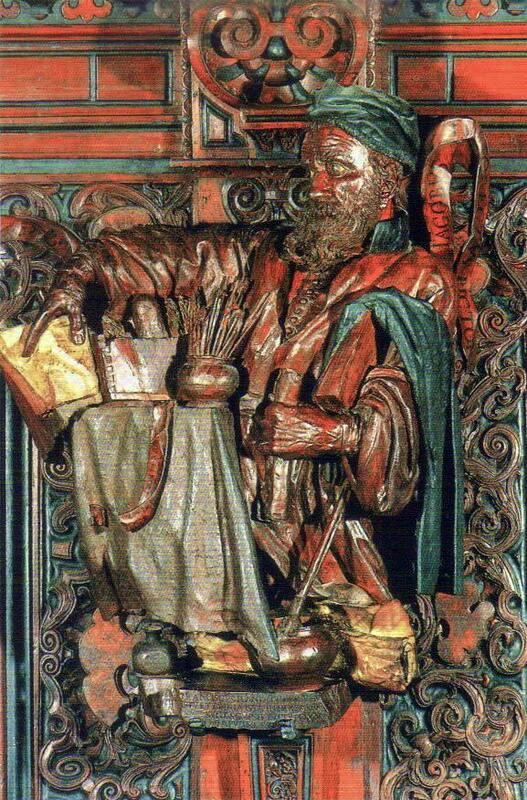 Today, San Rocco is the patron saint of, not surprisingly, dogs and falsely accused people, and the scuola named for him is the only one in Venice to have been spared by Napoleonic edicts after the city fell to the French. Upon entering the scuola, I climbed up an unadorned staircase, turned on the landing, and was astounded by what suddenly greeted me. Paintings by Tintoretto — Venice’s prolific artist during the 1500s whose work kept popping up all over the city, no matter where I went — covered the walls of the top half of the staircase and the interior of the dome above me. I practically stumbled up the top few stairs under the arch into the Great Upper Hall, mesmerized by one of the most lavish interiors in all of Venice. Exquisitely carved woodwork line the walls of the Sala Superiore of the Scuola Grande di San Rocco. Heels clicked against the exquisite patterned marble floor as other concert attendees roamed around, amazed by the opulent surroundings. In between pairs of arched windows, about a dozen of Tintoretto’s oils depicting New Testament scenes (The Adoration of the Shepherds, The Miracle of the Loaves and Fishes, The Ascension) line the walls. Underneath the paintings, running the length of the hall, standing lanterns illuminate the highly polished wooden panels behind them, ornamented with human figures so finely detailed that I couldn’t resist tracing the bones and veins in the figures’ hands with my own. The Venetians clearly didn’t believe in the breathing room of white space: The elaborate display continues up to and all across the ceiling. 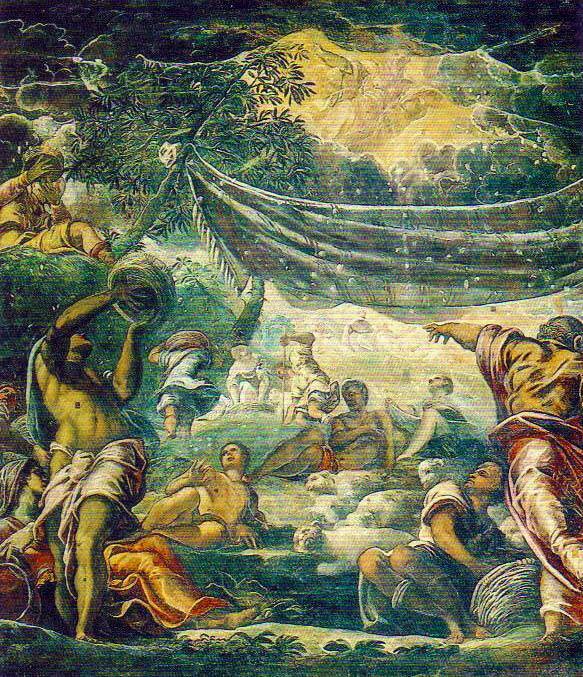 Another dozen oil paintings — scenes from the Old Testament (Moses Drawing Water From the Rock, The Fall of Man, Jacob’s Ladder), also by Tintoretto — slather the heavily gilded and ornate ceiling. For a better view, I picked up one of the framed mirrors, provided by the scuola to help visitors admire the art above them without having to throw their heads back and tip over in awe. Amid this incomparable setting, I took my seat, awaiting the musicians in the Interpreti Veneziani ensemble, which debuted in 1987, to begin. They assembled in front of The Apparition of St. Roch, Tintoretto’s impressive 8-foot by 16-foot oil of this revered saint, and the lights dimmed. They opened The Four Seasons with “La Primavera” (Spring), and a smile came across my face at the familiarity of this movement. Here I was, listening to the masterpiece of my favorite classical composer in one of my favorite cities in the world. I realized it was one of those experiences when you’re doing exactly the right thing in exactly the right place at exactly the right time — an exceptionally rare trifecta that epitomizes the glory and thrill of travel.